Volume 3, Issue 4 is exhibit of valedictory works by recent Fine Arts graduates. The show is curated by Leo Abaya. Their works broaden typically explored themes in contemporary art: those of body, identity, time and place. 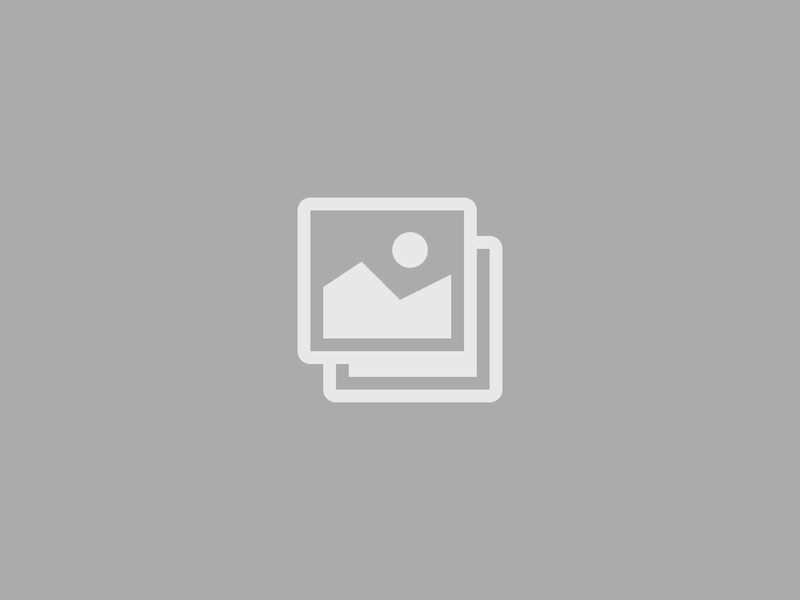 Concerns arising from this thematic frame are adroitly woven and translated into creative expressions with materiality and form firmly grounded in understandings of the human condition. The mutable geography that is their art may best represent both a quest and a plea, stoked by a fervent desire to know and to make sense. The impulse to make sense is consistent strain in the artists’ works, whether conveyed through narrative, deployment of technique, manipulation of material, activation of space, or engagement of the senses. These young artists harness the forces of creativity and wield them in ways that enable us to reflect on existence. For to ‘make sense’ is to ‘make the world’ anew; an endeavor firmly rooted in the imagination. 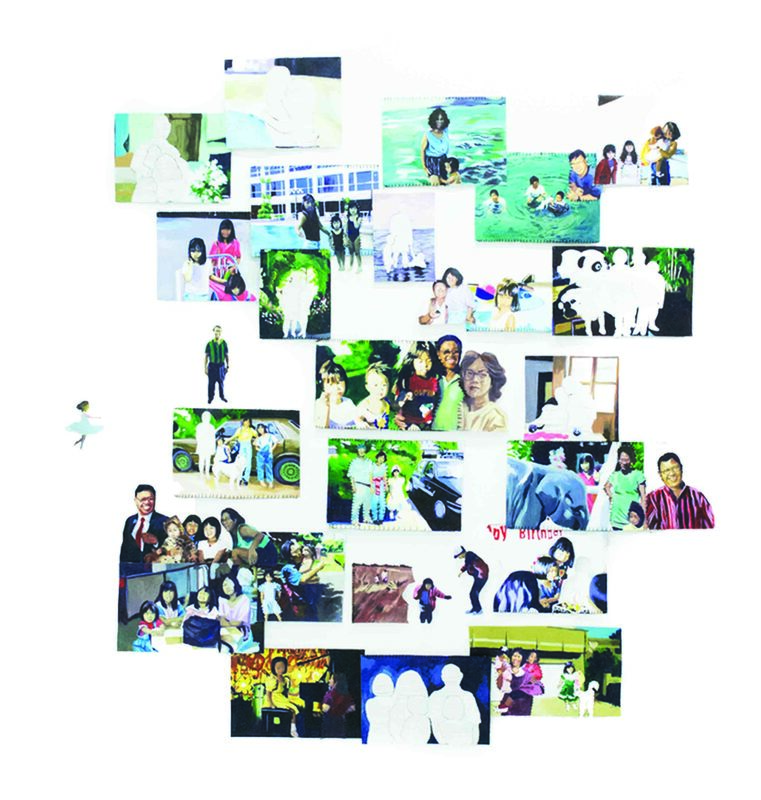 Working around staple themes in contemporary art, young artists Pau Abayon, Roan Alvarez, Pope Bacay, Pin Calacal, Nathalie Dagmang, Jess de Leon, Jack Giron, Lui Gonzales, Kitty Kaburo, Henrielle Pagkaliwangan and Noelle Varela, are buoyed by gestures of movement and transformation. 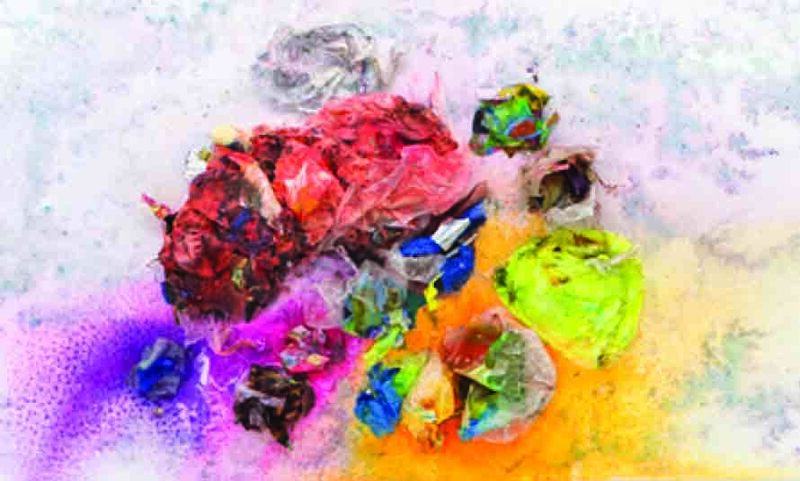 Dispersal, dissolution, atrophy and creation underlie the processes that inform pieces for the exhibition. Forms morph, experiences are distilled and translated into static or moving formats, physical bodies are reduced into sensate feelings, and places comprise persistent itineraries. Their works draw from their inner worlds with their art transporting an atmosphere of combined disquiet and wonder into ours. Pau Abayon, Pin Calacal, and Jess de Leon dissipate the body’s flesh through the vehicles of pain, malaise and trauma. 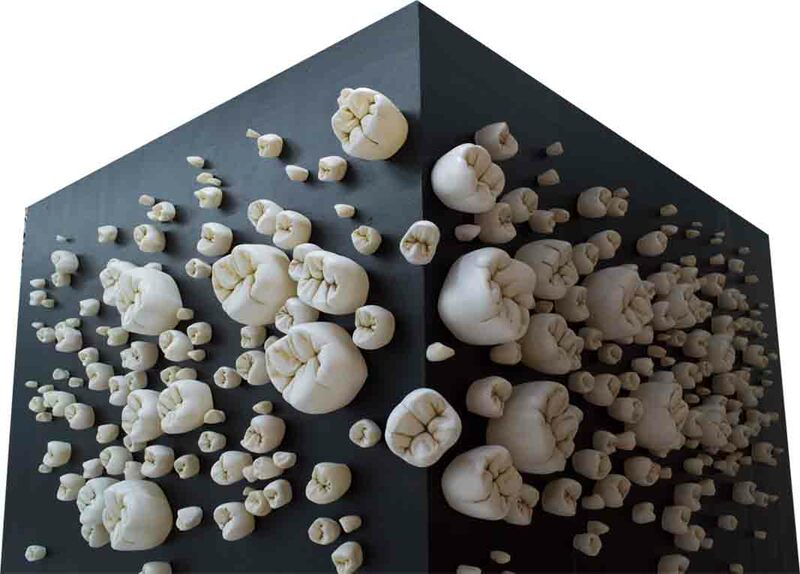 Abayon’s installation Eruption is composed of large scale acrylic resin human teeth. Incisors, molars, and canines are presented in varying sizes succeeding to dismantle our relationship to our body through magnifying and drawing out bones from inside our mouth. The piece is our body turned inside out in the same way that teeth grinding reveals suppressed distress. Calacal on the other hand, reworks and integrates physical illness into the vehicle of drawing. Her works forthrightly titled Sick Drawings traces the lineaments of control in the preciseness demanded by the act and practice of drawing. Hands and body parts are traced over and over in slightly wavering strokes and lines, their overlaid outlines fully capturing the artist’s elucidation of illness. Jess de Leon recalls the trauma from near drowning through ripples of water. Incisions are paper cut-outs installed overhead that represent de Leon’s overwhelming feeling of being helplessly submerged under water. Noelle Varela on the other hand celebrates the feminine body in her large scale and disproportionate depictions of female genitalia. Building the pieces together using sawdust on wire armature, she renders a shift from intimacy to visibility by way of scale. Varela’s work is fitting transition to pieces by Roan Alvarez, Jack Giron, Lui Gonzales, and Henrielle Pagkaliwangan. All four artists further examine visibility through the invention of public personas. The fabrication of selves is persistent thread in the loom of their works. Inventory, grafting and overlaying are processes that can be identified in their pieces. 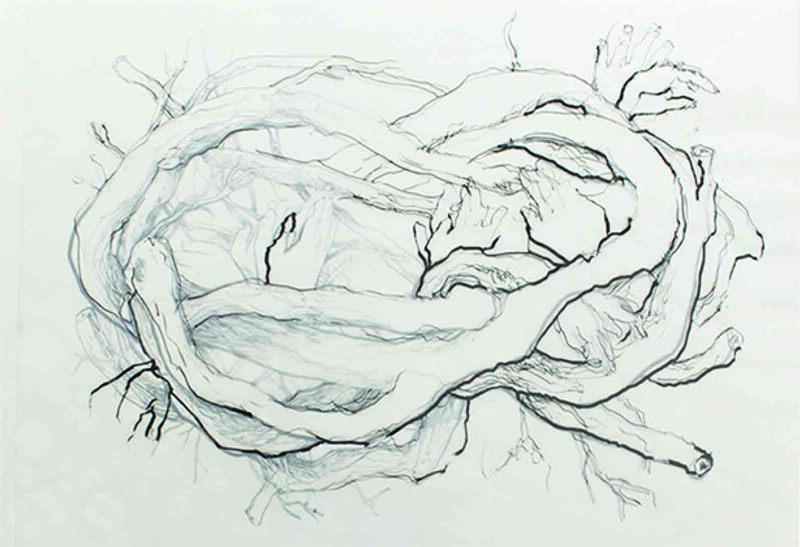 Henrielle Pagkaliwangan’s Taxonomy of Things are pen and ink drawings of objects. Citing these objects as ‘personal effects’, they function to condense not only perceived worth but also entire personhood. Objects are imagined as extensions of the self with the body imagined to eventually disintegrate into inanimate forms. Alvarez, Gonzales and Giron employ diverse methods to convey the patchwork nature of identities. 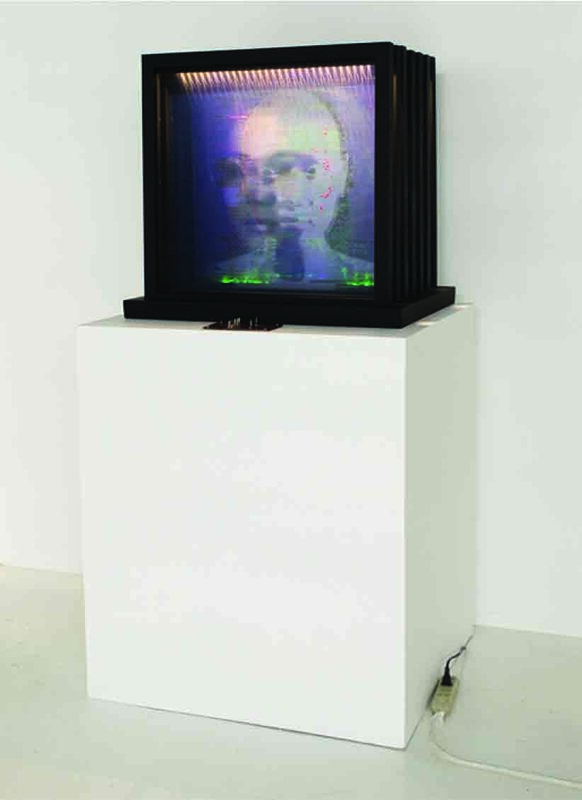 Alvarez’s transmedia work I to the nth Power captures with erudition the fabrication and modification of numerous versions of the self through media technologies. Gonzales’s pen and ink drawing Pinilas is a composite portrait of herself and other people; painstakingly drawn over each other. While there is an atempt to form a whole, the self can only be imagined fragmented and dispersed. Giron on the other hand, restructures the past by stitching together remnants of filial memento in Sewn Together, her acrylic and embroidery works on canvas. Contemplation is central force in these pieces recast in a mood of celebration and redemption. Pope Bacay and Nathalie Dagmang both map and scale topographies through documentary techniques. Bacay sutures two places to identify a singular albeit fractured location in a landscape painting. He veers away from the four-corner format of conventional surfaces by piecing together fragments in a puzzle-like manner. Instead of bafflement, we recognize a state of itinerancy that is only too familiar to a nation whose citizens are dispersed across the globe. 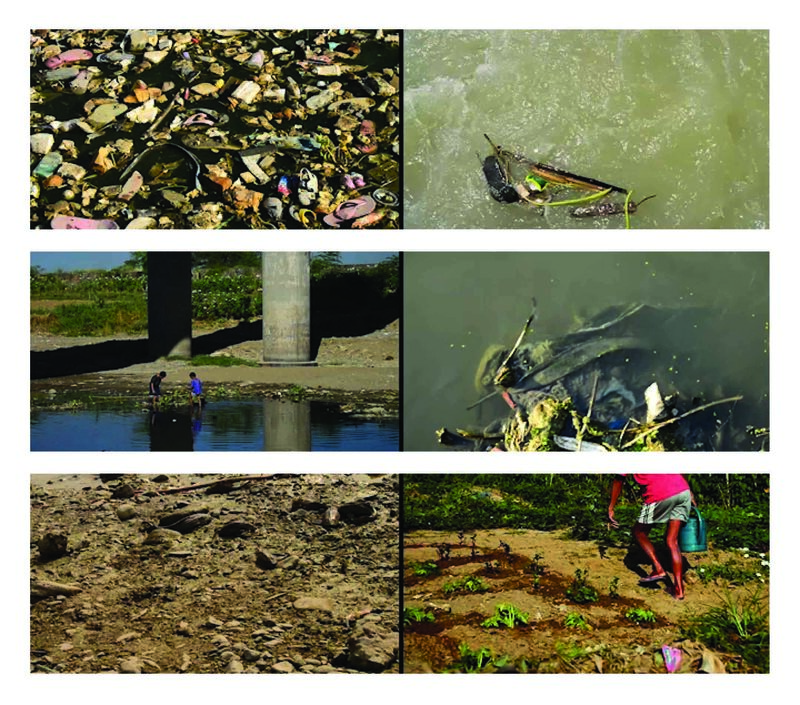 Nathalie Dagmang’s video installation Dito sa may Ilog ng Tumana incorporates the ethnographic as method in the medium of video and film, recreating her interaction with residents of a riverside urban community in Marikina. She ingrains herself within community by becoming familiar with a way of life other than her own and transforms the experience into the grainy surface of video. By installing these images on screen and inside space, she constructs an alternate version of the riverine community playing on distance measured by medium and language. 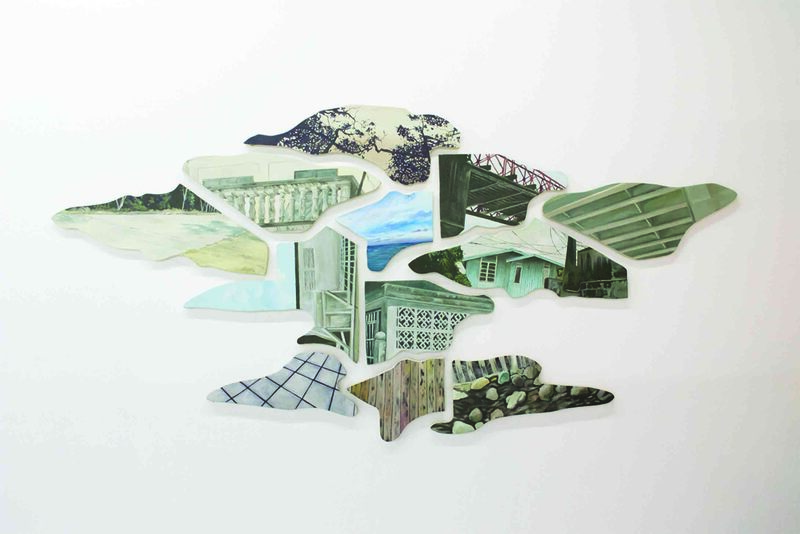 Kitty Kaburo captures in eloquence the demise of forms and their environments in the mix media piece The Mountains Become Sea. 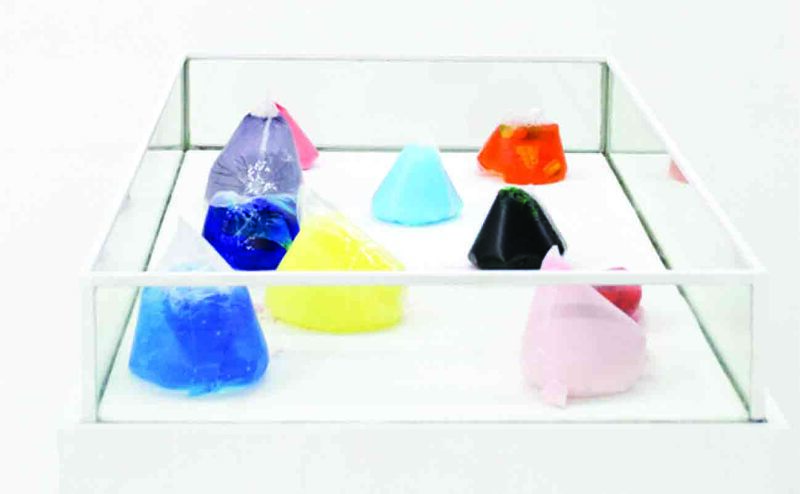 Cleverly incorporating ice into paint bags, she illustrates atrophy and the transformation of matter. Shifting from video to mix media, from flat surfaces to multidimensional environments Kaburo composes what she calls ‘visual triggers’ calling attention to the inevitable wasting away of bodies and sites. As these artists articulate the inherent dynamism that infuses life by working around notions of transformation and change, they bring to the fore not only their passage into another phase of art making and an artistic world but also the potential inherent to art and the ardor it feeds for hope to thrive; a great reason why it continues to matter in a world overrun by destruction, disorder, and despair.